Princess Olympia enjoys the end of summer in the Hamptons | HELLO! Princess Olympia of Greece is making the most of her free time before she returns to university at the end of the month. 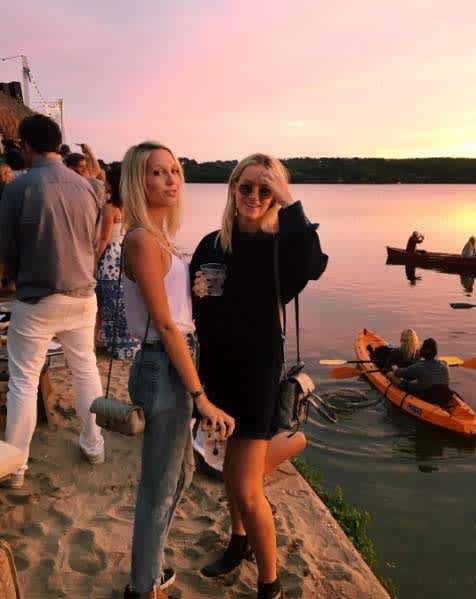 The 20-year-old, who studies at New York City's Parsons School of Design, has been enjoying the sun in the Hamptons with a group of friends. Olympia has been sharing photos from the idyllic getaway on Instagram, much to the envy of her 93,000 followers. One photo shows the royal laughing while standing on the beach in a cobalt blue bikini and sunglasses, with a drink in hand, while another showed her basking in the sun with the sea behind her. It has been an incredible summer for Olympia, who recently celebrated her 20th birthday in Mykonos. The fashionable royal has also been named as one of the four faces of Michael Kors' new street style campaign The Walk. Princess Olympia stars in the campaign alongside three other trendsetters, including Solange Knowles and models Soo Joo Park and Nina Agdal. Speaking about her personal style, the 20-year-old said she is inspired by her mother, Princess Marie-Chantal of Greece. "She's always telling me about the next thing to do with my hair or I'm always stealing her lip glosses," she said. "She's always taking my mascaras. Like we always take everything from each other."